We have been writing about behind the scenes efforts of politically powerful polluters to exert improper influence on DEP scientists. We have called this the War on Science. 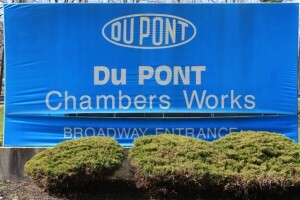 Today we focus on the ugly tactics of Dupont. But, first we put Dupont’s moves in context, and then present the game plan Dupont is following, via review of a superb new book by a scientific expert in the field. We disclosed documents that revealed that DEP scientists had to run a political gauntlet to publish a risk assessment on a chemical that has spread to contaminate drinking water. 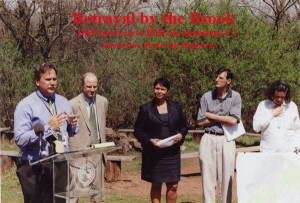 The controversy concerned perfluorooctanoic acid (PFOA), a toxic chemical manufactured by a NJ giant Dupont, used in nonstick cookware and stain resistant fabrics, such as Scotchguard.Those documents showed that DuPont was urgently pressing DEP regulators to lower a potentially multi-billion dollar clean-up liability for polluting groundwater. In a hostile move, lawyers representing DuPont filed several OPRA requests that personally targeted and intimidated the DEP scientists conducting the PFOA research. An audit by the U.S. Environmental Protection Agency faulted the quality and consistency of New Jersey science, quality assurance/quality control (QA/QC) and technical programs for cleaning up toxic wastes, preserving wetlands and other key functions. Scientific tactics in this war are laid out in detail in a wonderful new book by science professor David Michaels titled Doubt is their Product –How Industry’s Assault on Science Threatens Your Health. Michaels is a professor at George Washington University, former Assistant Secretary for Environmental Safety and Health at the Department of Energy; and is now candidate for Administrator of the US Occupational Safety and Health Administration (OSHA). Michaels exhaustively documents how industry, starting with the tobacco, lead, and asbestos industries, whose tactics were embraced by the chemical industry – has “manufactured doubt” to frustrate regulation, and as a result, killed and poisoned thousands of Americans. Using outright lies, denial, PR and then shifting to sophisticated “sound science”, industry is literally killing us. Dr. Tardiff's August 7, 2009 presentation of to the NJ Drinking Water Quality Institute scientists. Tardiff presented his own PFOA risk assessment to challenge the DEP risk assessment findings. Polluters and manufacturers of dangerous products tout “sound science”, but what they are promoting just sounds like science but isn’t. Only the truly naive (if there are any of these folks left) will be surprised to learn that the sound science movement was the brainchild of Big Tobacco. George Orwell has given us a word fr such rhetoric. The vilification of any research that might threaten corporate interests as “junk science” and the sanctification of its own bought and paid for research as “sound science” is indeed Orwellian. 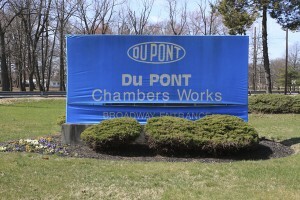 In addition to the ugly attacks on DEP scientists by Dupont lawyers mentioned above, Dupont is engaged in a classic uncertainty campaign and war on science that so concerns professor Michaels. I attended Dupont consultant Dr. Tardiffâs August 7, 2009 presentation of to the NJ Drinking Water Quality Institute scientists. Tardiff presented his own PFOA risk assessment to challenge the DEP risk assessment findings. Tardiff followed classic “manufacture doubt” tactics by challenging the validity of the animal studies that show that PFOA is a human carcinogen. Yet despite this over the top attack, not one DWQI scientist publicly challenged Tardiff’s misleading and radical conclusions. Clearly, they were intimidated and reluctant to call Tardiff out. A single one of the above actions would be a problem. Taken together they are deeply disturbing. In our next post, we will name names of industry scientists – including Dupont employees – that the chemical industry is pushing to control the new DEP Science Advisory Board. We recently warned of a Hostile Takeover of DEP Science – Industry Seeks to Stack Board with Cronies , the latest in an orchestrated War on Science by politically powerful polluters and developers in NJ. The Star Ledger reported on that in a September 20, 2009 story: Scientists line up to join DEP’s controversial new advisory panel. The Bush administration has made some unwise recent moves that undermine the process by which scientists provide advice to the U.S. government. The applicable current law (the Federal Advisory Committee Act), which requires these advisory bodies to “. . . be fairly balanced in terms of the points of view represented and . . . not be inappropriately influenced by the appointing authority or by any special interest,” is more than empty boilerplate…. Instead of grappling with scientific ambiguity and shaping public policy using the best available evidence (the fundamental principle underlying public health and environmental regulation), we can now expect these committees to emphasize the uncertainties of health and environmental risks, supporting the administration’s antiregulatory views. And in those areas where there are deeply held conflicts in values, we can expect only silence. Regulatory paralysis appears to be the goal here, rather than the application of honest balanced science. In fact, DEP Commissioner Mark Mauriello is meeting with the Chemistry Council this Thursday to discus SAB appointments. Commissioner Mauriello, in contrast to federal law that mandates balance and prohibits inappropriate influence by special interests, has virtually unbounded discretion to appoint SAB members. So, with some of the documents already in hand, I filed an OPRA request to obtain all of them. But in an attempt to keep this chemical industry campaign a covert war, DEP denied the OPRA request. In response, today, PEER filed a lawsuit against DEP seeking all the documents. We are confident that we will prevail in this lawsuit and that the documents will disclose industry pressure to politicize science at DEP and protect polluters from DEP regulations. This industry effort must be derailed. Formal industry control over DEP science would have profoundly detrimental impacts on the health of residents and the natural environment. See below press release for details. Trenton – Industry wants to pack a new state environmental Science Advisory Board with its own scientists, according to Public Employees for Environmental Responsibility (PEER) which today filed a lawsuit to obtain public records regarding the industry lobbing effort. Department of Environmental Protection (DEP) Commissioner Mark Mauriello is reportedly making final picks for the 12-member board this week after meeting with the Chemistry Industry Council this Thursday. The suit challenges the denial by DEP of an Open Public Records Act (OPRA) request filed by PEER seeking public records related to industry nominees and political lobbying for the Science Advisory Board (SAB) appointments. 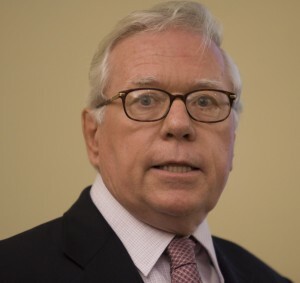 The DEP broadly claimed that practically all the requested documents are exempt from OPRA on the grounds that the pending appointments will be treated like candidates for employment, and thus confidential. Board members, however, are not DEP employees, nor would they be paid. In late 2008, former DEP Commissioner Lisa Jackson abolished the Division of Science and Research, based in part on a recommendation of her Permit Efficiency Task Force, chaired by Chris Daggett, now an independent candidate for Governor. The Science Advisory Board is supposed to substitute for the work formerly done by DEP scientists. Thus far, more than 100 nominations have been submitted. Industry associations have put forward scientists from major manufacturers such as DuPont and Merck as well as from engineers and technical specialists from industry-oriented consultant firms. This Thursday, October 1st, Commissioner Mauriello, who chooses the board members, will meet behind closed doors with the Chemistry Industry Council of New Jersey, the primary lobby group representing state-based manufacturers. In recent months, DEP scientific studies have been the subject of intense industry lobbying pressure to amend or suppress, on public health topics ranging from the effects of chemicals, such as PFOAs made by DuPont, to cement dust blowing through Camden neighborhoods. The Administrative Order creating the SAB specifies a conflict of interest review of board nominees but it is not clear what specific rules will be applied, except that members are not supposed to act on matters in which they have a “financial or personal interest“ terms left undefined. The OPRA lawsuit was filed today on behalf of PEER by Michael Pisauro of the Princeton-based firm of Frascella & Pisauro, LLC. My kids go to school in Pittsburgh, so on Thursday I headed out to see them and witness and participate in the G 20 Summit protests. Because the G 20 Summit provides a world stage, I was there to warm of “climate destruction ahead” and to advocate for a substantive global warming agenda for the upcoming December Copenhagen Climate Conference negotiations. 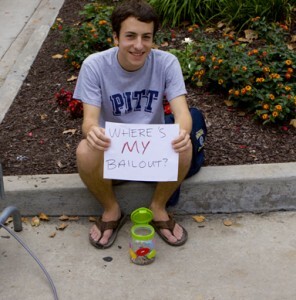 But there are other major pressing economic policy issues related to the need to regulate global finance in light of economic collapse, as well as to re-conceptualize global “free trade” and economic development frameworks to protect labor and promote economic and social justice. I was appalled by what I saw – and I’m obviously not talking about my kids. It sure looked different than the welcoming Pittsburgh I visited, photographed and posted here. I’ve never been on the wrong end of a shotgun before. Face to face – it is not a good feeling. 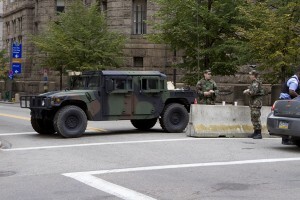 Downtown Pittsburgh in military lockdown. But that’s not nearly all I saw. There were the dogs, Humvee roadblocks, no pedestrian zones, downtown lockdown, fenced off areas, designated protest zone, hundreds (thousands?) 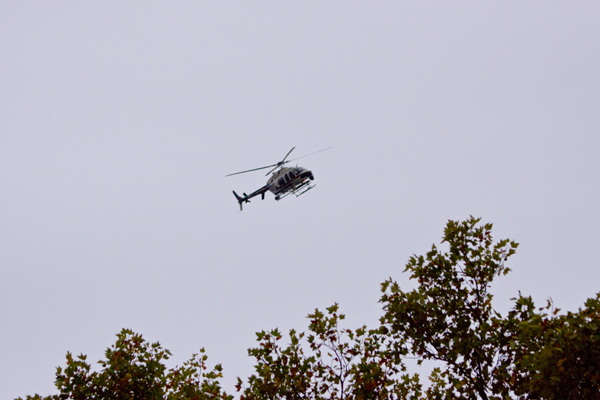 of military troops, helicopters, constant overhead military aircraft (F-16’s? 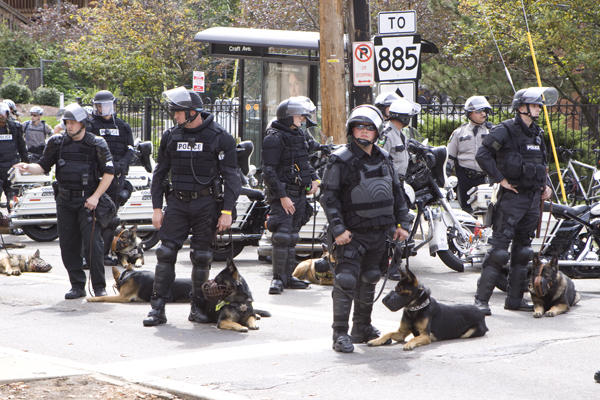 ), chemical gases, and even – the first time ever deployed in the US – ear splitting sonic crowd control technology. 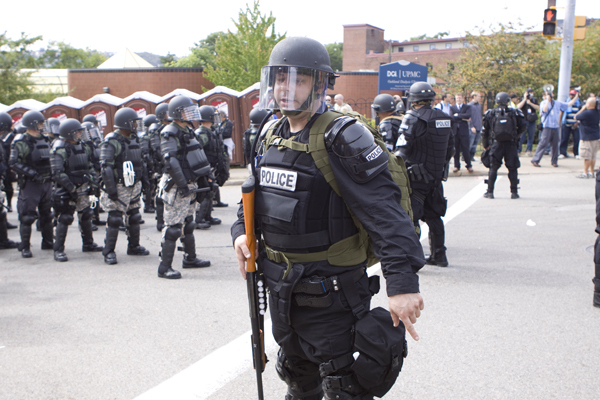 Overwhelmingly peaceful people were met by a massive show of militarized police force. 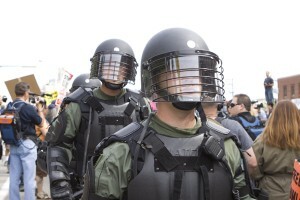 Riot gear armored police and military troops significantly outnumbered protestors. I personally witnessed provocative, intimidating and repressive military tactics I had imagined were limited to third world countries, not the freedom loving USA. I directly experienced this when a group of 15 or so military troops – in full riot gear – marched aggressively and directly through a crowd at the Merton Center Rally. 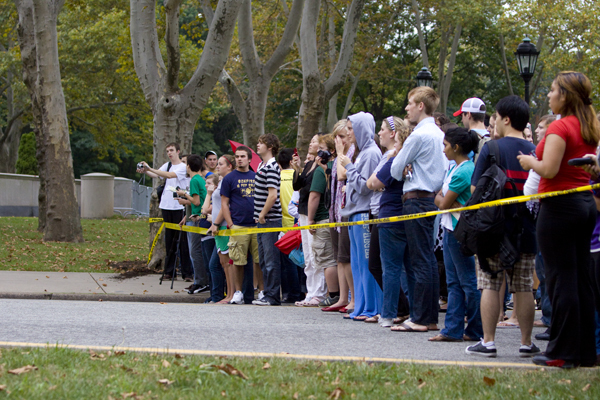 The crowd was attending a peaceful permitted rally before a march. 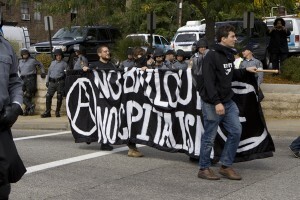 Small groups of anarchists - do these kids look scary to you? 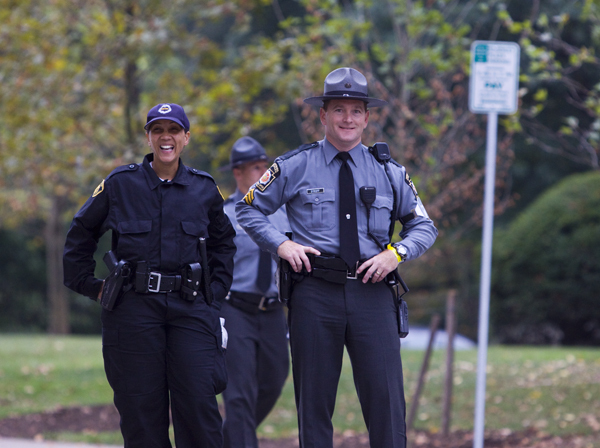 I talked to several people, all of whom described similar examples of where police and military units initiated violence, precipitated violence, or severely over reacted to minor threats associated with overwhelmingly non-violent protests. After I got home I viewed several YouTube videos of events that confirmed this overreaction – just do the Google and see for yourself. 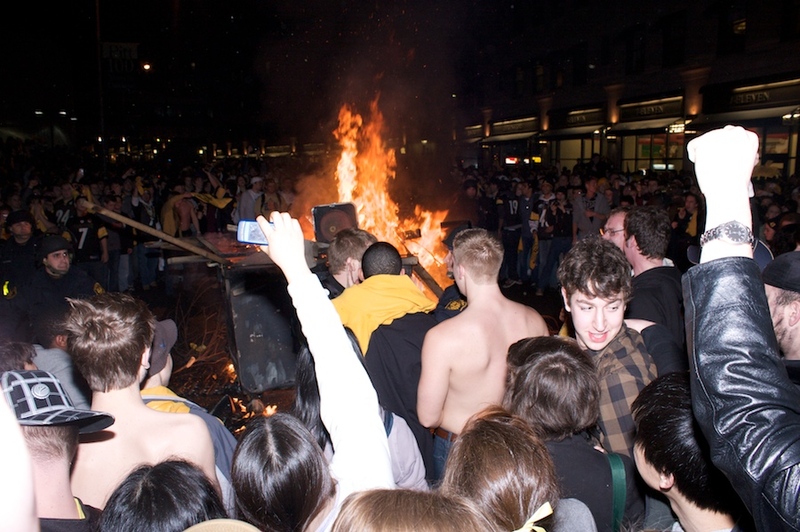 The tear gassing of University of Pittsburgh students looked particularly egregious. 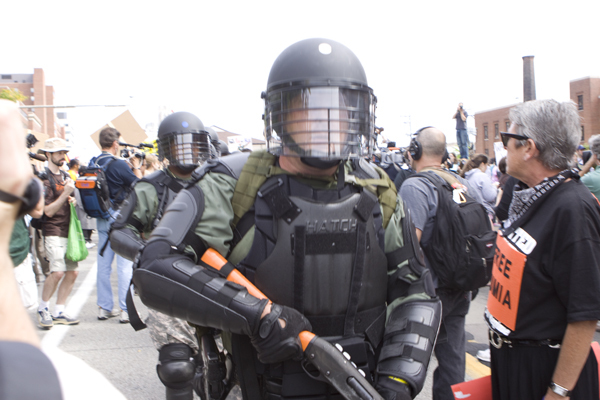 This level of militarized intimidation is un-American and raises serious questions about constitutionally guaranteed rights of dissent and protest – free speech, association, and opportunity to petition government for redress of grievances. These are not mere words to me – I believe strongly in them. I watched videos where the protestors appealed to military units to respect their constitutional rights, only to have the troops ignore them while arbitrarily declaring peaceful protest illegal assembly. 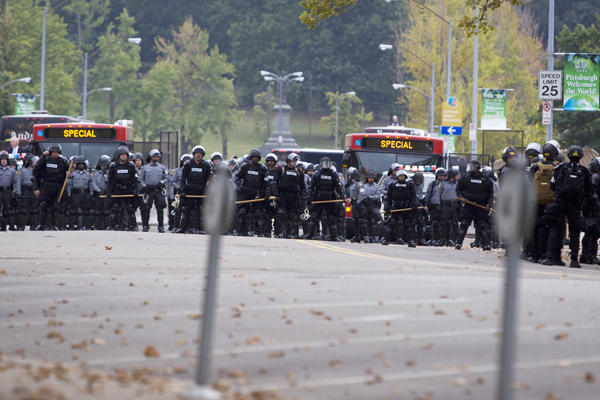 The scenes were redolent of a police state. Protestors were not allowed anywhere near where the G 20 Summit was held, so President Obama and world leaders were totally isolated and could not hear their voices or see their signs. 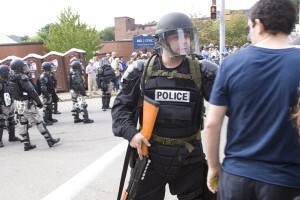 And – of course – the media focus on police over-reaction and scattered minor property damage by a handful of anarchists totally obscures any public discussion of the policy agenda before the G 20 and world leaders – important issues are being ignored – watch “G 20 Summit in Pittsburgh Highlights Economic Decline of Former Steel Capital“. 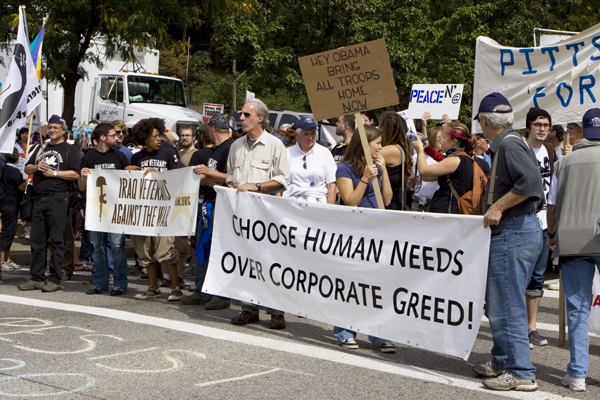 In this time of economic collapse, accelerating global warming, and war, citizens engagement and protest needs to be valued and encouraged. But when police state tactics intimidate protest and dissent and media diversion squelches informed public discussion of critical issues, our Constitutional values are assaulted and necessary democratic pressure for reform is derailed. Protestor reads from militasry and police training manuals to advise troops of non-violent and effective crowd control tactics. Why is the chemical industry allowed essentially to regulate itself on such a critical public safety issue? Why are risks from deadly accidental chemical releases to communities kept secret? The core elements of Corzine’s state level chemical plant safety program regulations, e.g. whether a chemical plant must upgrade technology or change operations to reduce risks – are VOLUNTARY and decided by industry, not MANDATORY and selected by government (see: Toxic Catastrophe Prevention, inherently safer technology, Security at chemical and petroleum facilities, et al). 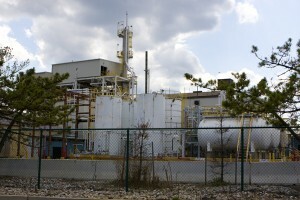 Critical aspects of the chemical plant safety program, particularly with respect to public disclosure of health and safety risks posed by chemical plants on nearby communities – such as “off site consequence analyses” that provide maps of the zone where all exposed individuals would die – are kept secret and under control of the Homeland Security regime, not DEP regulators. Homeland Security type restrictions mean that this critical information is kept secret, and exempt from public right to know (RTK) and public records laws (OPRA). 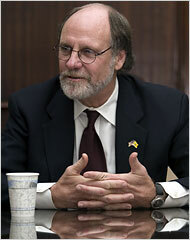 As a United States senator, Jon S. Corzine was relentless in warning that the nation’s chemical plants, and the railways that carry their potentially dangerous cargo, are vulnerable to a devastating terror attack. But in the 11 months since he was sworn in as New Jersey’s governor, Mr. Corzine has taken a far more measured approach to the issue, disappointing some of the chemical security experts who helped him form his proposals in the Senate. These advocates say that the Corzine administration has made little tangible progress on increasing security at the 15 New Jersey chemical plants, and that each plant poses a threat to 100,000 people or more. They accuse the governor of being too intent on appeasing the chemical industry, which provides more than 80,000 jobs in the state…. But those rules do not require the companies to adopt the safer processes if they deem them too expensive. 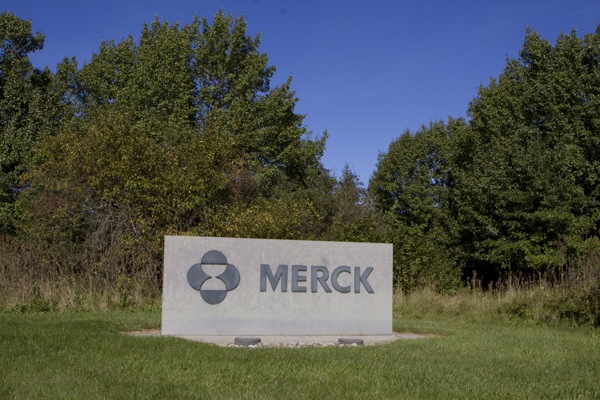 And chemical safety advocates, like Rick Engler of the Work Environment Council, say it is often hard to know how much progress has been made because the state has been unwilling to release much information…. State environmental officials have acknowledged that many of the state’s most dangerous plants continue to use and store stockpiles of toxic chemicals near major population centers. That would include the chlorine plant in Kearny, in Hudson County, only about 10 miles from Midtown Manhattan, which Mr. Corzine toured with the 60 Minutes crew. I guess Corzine sure is no carpenter, because he’s kept that “super hammer” well sheathed. ps – to understand what’s really going on, forget the press releases – you gotta read the fine print of the regulations, like this (see boldface) – this pretty obviously says that the key protective decisions are up to the industry not DEP regulators, and that plant economics can be considered (economics means profits). So the chemical industry itself decides what risks (of death) are feasible and worth reducing: profits before people is policy. Unless you closely follow the technical discussion on the NJ Highlands email listserve, you probably don’t know that DEP abandoned a key regulatory tool to protect critical habitat of the State threatened species, Wood Turtle. There were no press conferences, action alerts, sign on letters or other forms of protest by environmental groups. Yes, if one knew where to look, one could find some mention opposing this rollback by reading the fine print of written comments formally submitted to DEP on the rule proposal by a few conservation groups with biological expertise. But no major political or media opposition was mounted. As a result, there was no press coverage to alert the public and no accountability for the DEP politicians who did this vile deed. In fact, you might have just the opposite impression, because the DEP rule proposal that abandoned protections for the wood turtle – and countless other species – was SUPPORTED by environmental groups. It received VERY FAVORABLE press coverage. This occurred, despite a January 2007 warning letter signed by numerous groups, strongly urging DEP Commissioner NOT to make the regulatory change to current regulations that can be used to protect wood turtle habitat. In a late December meeting attended by many of our groups, the Department outlined its plan for a new process to guide the designation of Category One waterways. The meeting afforded only a cursory overview of what would represent a very fundamental change to clean water protections in New Jersey, but did provide an outline of the narrow set of water quality indicators that might serve as the basis for deciding future C1 upgrades. We have serious objections to the proposed designation process and fear that its implementation would strip New Jersey of the ability to adequately protect and maintain its high quality waterways. If enacted, this method would reverse tremendous advances in clean water protection in the state, contradict the commitments made by Governor Corzine, and leave New Jersey without the ability to adequately protect and maintain many of its most deserving waterways. Wood turtles are semi-aquatic turtles preferring clear, well-oxygenated streams surrounded by a mosaic of woodlands, scrub-shrub/herbaceous wetlands, and successional meadows. In New Jersey, the wood turtle is commonly associated with water-quality sensitive fish such as native brook trout and brown trout. While once ubiquitous throughout northern New Jersey, most of the viable wood turtle populations remain in rural portions of Sussex and Warren counties. In order to protect the wood turtle and its critical habitat – as well as habitat for numerous aquatic or aquatic dependent species – in 2002, DEP strengthened and greatly expanded water quality regulations – known as “Category One” (C1) waters – to implement the “antidegradation policy” mandated by the federal Clean Water Act. Federal law requires states to adopt antidegradation policies and implementation procedures. Anti-degradation policy seeks to assure that exceptional high quality waters are not degraded by pollution. For the first time, using anti-degradation legal tools, DEP gave these exceptional waters real regulatory protections, by providing 300 foot wide stream buffers (on each side), where soil and vegetation may not be disturbed by major development. Starting in early 2002, DEP began to classify C1 streams and rivers based upon “exceptional value” ecosystems. DEP also began designating streams and rivers that drained to reservoirs to protect water supply. Previously, this C1 classification was limited to a few hundred stream miles that supported naturally reproducing trout populations. Yet, even despite the C1 designation, historically, those streams were unprotected by DEP regulations. The result of the new DEP C1 policy was a huge expansion of over 2,000 designated C1 stream miles and – at 75 acres of stream buffer per mile – thousands of acres of riparian land in new protected C1 stream corridors. These DEP regulatory moves were strongly opposed by the NJ Builders Association, pro-development industries, and property owners. Builders particularly opposed the new DEP policy of linking water quality and habitat, and using the “exceptional ecological significance” Clean Water Act policy tool to regulate development and land use to protect water quality. The wood turtle became a poster child in this debate, because thousands of acres of land were classified as wood turtle critical habitat. Therefore, thousands of acres of such land located in stream corridors could beÂ regulated and made off limits for development via DEP designation of C1 waters. (I really wish DEP would stop killing these links! Just restored- the links 4/13/16 to above 3 C1 proposals). Under the new pro-economic development Corzine/Jackson DEP, the legal ability of DEP to designate C1 streams on the basis of wood turtle – and numerous other threatened and endangered species – was lost by DEP in a May 21, 2007 rule proposal where DEP revised the C1 designation methodology. 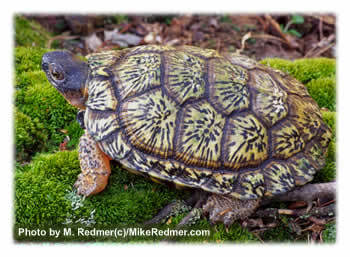 The revisions greatly narrowed DEP’s ability to designate C1 waters and eliminated wood turtle as a basis for doing so. The new DEP C1 designation method limited exceptional ecological value to a short list of specific species – if a species was not listed, it was not protected. The list did NOT include wood turtle. For the wood turtle, the fight for riparian habitat protections is over – DEP unilaterally surrendered. The only protections remaining are case by case, site specific mitigation in individual land use permits – a formula for extirpation. A colleague advised that the NJ Builders Association recently filed a petition for rulemaking urging DEP to delist pine snake and eliminate certain site specific regulatory protections for its habitat.